Usup (right) giving the thumbs-up to a close friend George Ngipa. 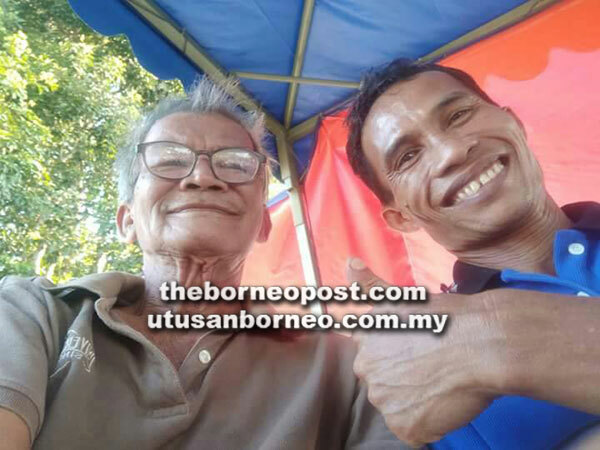 LUBOK ANTU: Tuai Rumah Usup Mit of Memaloi, Skrang Hilir held a thanksgiving celebration not just for his appointment as longhouse chief but also for a new longhouse after the old one was dismantled to pave way for the Pan Borneo Highway project. The celebration was held at a temporary longhouse yesterday. Usup, in his welcoming speech, said he was happy with Engkilili assemblyman Dr Johnichal Rayong Ngipa for granting RM200,000 under the Rural Transformation Project (RTP) for clearing the site for the new longhouse just across the road from the old 41-door longhouse. He was thankful that the 41 families had decided to follow him to relocate to the new site. However, he lamented that the project was behind time due to technical problems. Usup also lamented the frequent interruption to the water supply to their village. “Even now for four consecutive days, we had no water supply. I hope that the authority concerned would address and rectify this problem,” Usup said, adding that Rayong had been briefed on the water woes. Usup also hoped that electricity would be connected to their new homes by Sarawak Energy Berhad as soon as the new longhouse is completed. Interestingly, local community leader Penghulu Nyambong Maweng’s house was demolished to pave way for the highway project. “It’s kind of sad. After you have built a beautiful house, it is now demolished. What can we do when we have to give way to the Pan Borneo Highway project which all of us want in the first place,” said Nyambong.